We went to a lecture a while back (June 13, 2016), at the University of Alberta, by renowned astrophysicist Dr. Jocelyn Bell Burnell (she was also receiving an honorary PhD). She was the first person to discover signals from a pulsar, in the 1960’s, while a graduate student at Cambridge University in Britain, and has gone onto an esteemed career in astrophysics since that time. That has involved time at a number of different universities in Britain and North America. Her supervisor at the time, Anthony Hewish, won the Nobel Prize for this discovery and subsequent analysis. 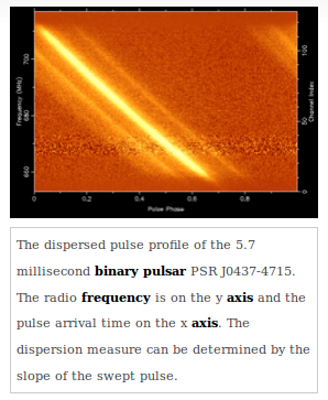 Many people think she should have shared in that prize, given her role in the entire process of discovering the first pulsar, from helping build the radio telescope, to first noticing the “scruff” that was the pulsar signal, to playing a significant role in the data analysis that led to determining that the scruff was actually a major astrophysical finding. She herself is untroubled by the fact that she didn’t share in the Nobel – as she has stated, a research student doesn’t normally get that level of recognition, male or female. She has, however, been a key and very active figure in advancing the status of women in the physical sciences, partly as a result of her own interesting background. Her U of A talk focussed on a relatively new development in astrophysics, known as “transient astronomy” (no, that isn’t astronomy done by wandering Post-docs). Essentially, this refers to very short observations of astrophysical phenomena, such that changes that occur on short time scales become evident. Most often, astronomy has been done on long time scales – “long stares” as she put it. An example is the 143 hour Hubble Telescope observation of deep space, which yielded many thousands of galaxies, in a section of the sky that was equivalent to observing a tennis ball from 100 meters away (i.e. a very small angle of the sky was subtended, roughly a minute and one half, in degree:minute:second measure, by my calculations). 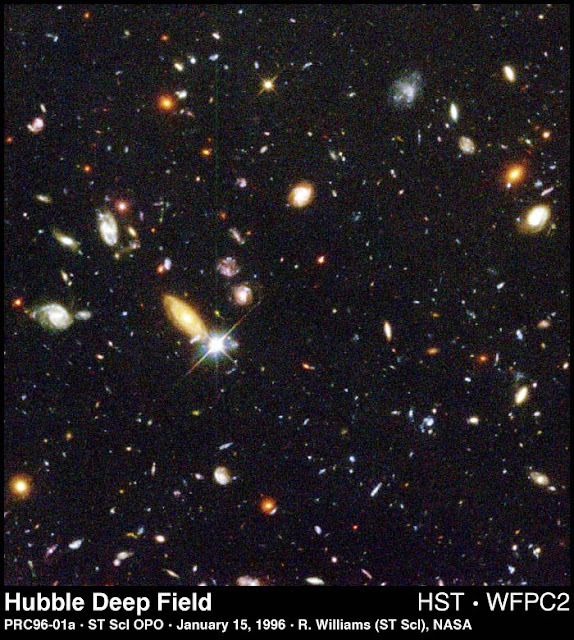 This kind of deep view is fascinating, beautiful, and informative (it gives you a great sense of just how big the universe is), but it misses things that happen on short time scales. Think of a fly going past a camera that has been set up for a very long exposure of a landscape – at best a blur might be recorded, perhaps not even that. So, deep stares can miss things. It’s the same with astronomy – a long stare will miss some events, from near-Earth asteroids to deep space fluctuations such as bursts of radiation from distant stars. Some types of astronomy have long been used to looking for transient events, while it is new to other types of astronomy. This is generally dependent on the wave-band of the electro-magnetic spectrum being observed. X-ray and gamma-ray astronomy have always been interested in transient events, while visual and radio astronomy have been more likely to collect and average data over long time spans. The very fact that X-ray and Gamma-ray observations have needed to measure low photon counts has meant that events that happen over short time frames were always in play. Visual astronomy, on the other hand (especially in the days of film cameras), necessarily tended towards long exposures, in order to gather enough light to bring out distant objects. These days, though, transient astronomy has moved into the other wave-bands. “Small” visual telescopes (small compared to the 10 meter sizes now available, such as the Keck Observatory in Hawaii) are ideal for these observations, and this has given new life to those observatories that house small telescopes (note that the famed 200 inch Mount Palomar telescope is now “small” by current standards). A big impetus to transient astronomy has been the development of the CCD or charged couple device. That’s the electronics in a camera that have taken the place of film. Charged coupled devices can be made very sensitive, so that a small count of photons can trigger them, and thus produce an image without long exposures, thus capturing transient events, whether those be motion of sudden increases in brightness. However, these images can also be “stacked” in a computer, so that a large number of short exposures can be added together, to get the effect of a single long exposure. The two key features of transient astronomy are sudden changes in brightness and motion, so these are what astronomers look for. Motion, or rapid changes in position in the sky, are naturally characteristic of objects close to the Earth. Asteroids and comets are the main players. With the growing awareness of just how many near-Earth objects are out there, this form of astronomy is of obvious interest and importance. Besides being of intrinsic interest, these objects present a danger, so a number of observation projects and sky surveys have been implemented to keep watch. 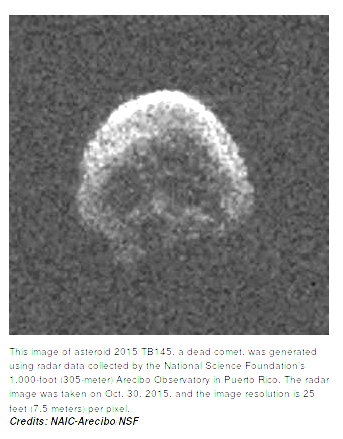 Last year's eerie “Halloween asteroid” is a good case in point. Changes in brightness can be due to a wide range of objects, from those in the solar system, to extra-galactic sources. In the former case, the brightness of an asteroid might depend on which part of it is facing the sun, thus giving rise to short term brightness fluctuations. In the latter case, a large number of extra-solar system objects can suddenly change brightness, producing flares in some part of the spectrum that are observed on Earth. 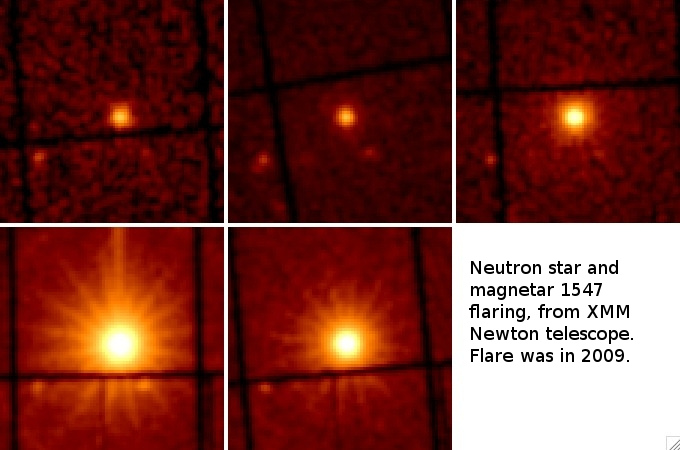 For example, red dwarf stars can produce short term flares, as can neutron stars. The neutron star 1547 is shown over a series of observations, flaring and subsiding. 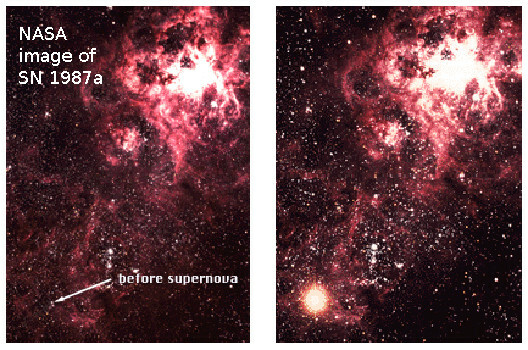 The ultimate short term events are cataclysmic events, such as super novae (the famous supernova of 1987 in thr Magellanic Cloud is shown below). Active galactic nuclei (AGN) and cataclysmic variables stars are also prime examples – these can involve gravitational effects such as black holes at the center of galaxies or orbital interactions between high mass objects, such as white dwarfs. Thermonuclear fusion of material on white dwarfs can also result in large outbursts of energy. Transient events are going on all the time, so sky surveys have been set up to look for and record these. Communications systems have been arranged, so that researchers around the world can quickly slew bigger instruments to areas of the sky that are of particular interest, for a closer look. These sky surveys can observe thousands of transient events in relatively short time frames. The Large Synoptic Survey Telescope, a new kind of telescope, will be a key player in the visible spectrum, in the hunt for transient events. It will be able to survey the entire sky in a few nights, enabling discover of objects that have moved or brightened over short time spans. There are many more objects in the plane of the ecliptic (the plane in which planets orbit the sun), than had previously been considered likely. Most of these are probably asteroids. Short term flares from stars, that last on the order of only minutes. Observations which imply enormous energies are being released, probably from catastrophic events. Many of these are outside the area of the sky that includes the Milky Way, so they are probably extra-galactic. This technique makes use of the fact that the presence of large masses bends light paths. This means that distant objects can be temporarily magnified, when the alignment with the Earth is just right. These alignments are fleeting, so this well qualifies as “transient astronomy”. The object being observed passes behind a large mass (say a high mass star), and the light emanating from it is bent by the star, in the direction of the Earth. In this way, many light paths can converge on the Earth, effectively magnifying the object, the way that a glass lens magnifies the image of a small object, as we observe it with a magnifying glass or microscope. Some extrasolar planets have been discovered this way (though other methods are more effective), via a “blip” in the star’s light curve. We have even discovered “rogue planets” that are not associated with any star, via fortuitous alignments and micro-lensing. These are probably planets that were ejected from their solar systems, via gravitational interactions with other planets. It seems like an odd use of language, to call this “micro-lensing”, given that the gravitational lens itself can be as big as a class O giant star. But, there you go. Transient astronomy makes use of other parts of the EM spectrum, especially gamma-ray, X-ray, and radio frequencies. Gamma-rays have very short wavelengths, and therefore very high energies. They are the kind of radiation that we associate with nuclear explosions and the creation of comic book super-heroes, like the Incredible Hulk. Naturally, the latter case is just fantasy. The former, however, played an important role in gamma-ray astronomy, and transient astronomy. During the cold war, the U.S. sent up satellites to look for evidence of nuclear explosions, on the part of the Soviet Union (or any other non-U.S. nuclear power). 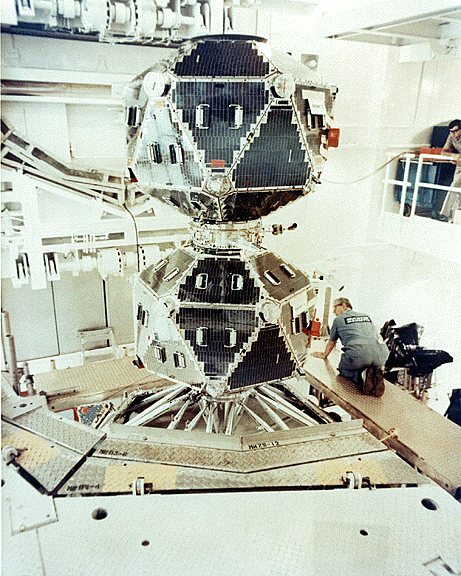 These were known as the Vela satellites. They did, in fact, detect gamma-ray bursts, but it was soon noted that these bursts seemed to be coming from the sky, rather than from the Earth, and thus were not Soviet bombs, but something else. The bursts were very bright, but short. There was about one burst per day. Bursts that lasted less than two seconds were considered short, while bursts that lasted longer than that were considered long. There was no particular pattern to them, in the sky. That implied that they were mostly of inter-galactic origin, else they would be clustered along the Milky Way. It is now thought that the short bursts could be from the merger of neutron stars, while the long bursts may be hyper-novae, which are likely caused by the collapse of high-mass stars into exotic objects like black holes. Magnetars, a type of very highly magnetized neutron star may also account for some of the long bursts. The long burst events would be caused by very rare events, with only a few events per galaxy per million years. But, there are billions upon billions of galaxies, so we observe a fair number of these events. Black holes are thought to be the source of both X-ray and gamma-ray transient events. A “regular star” that is orbiting a black hole can create transient “sputtering” as it falls into the black hole. The Swift gamma-ray telescope observed a gamma-ray burst that lasted for two days, an interval long enough that the most likely solution is that it is the death throes of a star as it is being dragged into a black hole. Neutron stars can also create very intense gamma-ray and X-ray events. 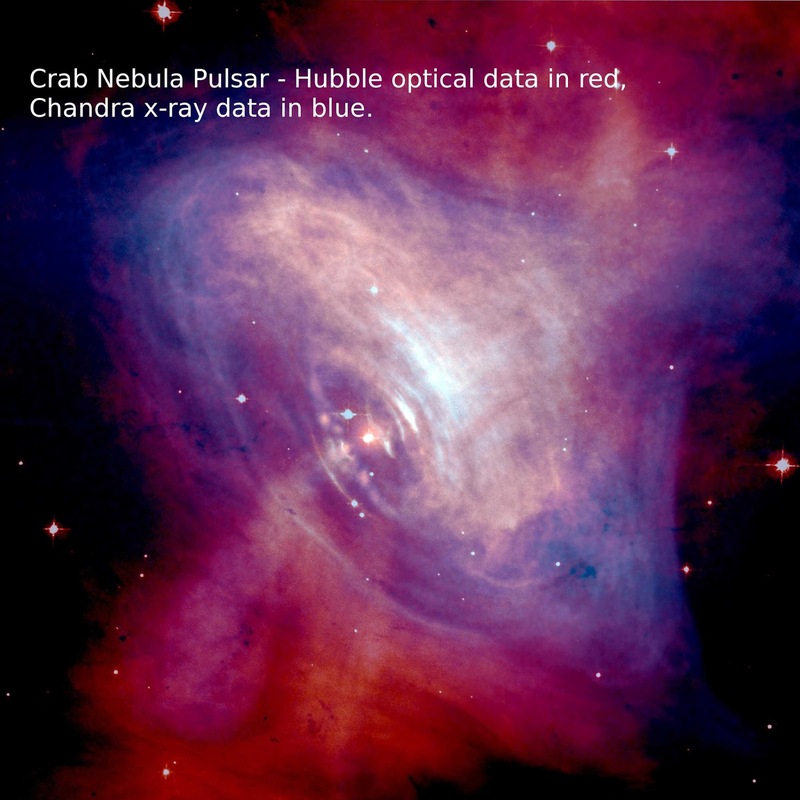 Spikes of gamma-ray fluence have been recorded from the Crab Nebula, that are up to 30 times normal background. This is probably from the pulsar in the heart of the nebula, created by the super-nova event observed in 1054 by Chinese astronomers. Astronomical phenomena have been observed in radio frequencies for many decades. In fact, radio astronomy is an outgrowth of radar development in WW2, so it is a well-established field. As noted in the introduction, Doctor Bell Burnell’s discovery of the first pulsar was via a radio telescope, at the University of Cambridge, England, which she helped to build. Much pounding of stakes was involved - she has said that made her very fit. Judging from the enthusiasm she put into her talk, shortly after a long plane flight, she is still very energetic. Radio signals are diffracted by going through physical media, such as the ionosphere in the Earth’s atmosphere, of the interstellar medium in space (notably effected by electrons in the interstellar medium). One can think of it as an effect similar to how light is split into different frequencies, by going through water droplets in the sky (a rainbow). In radio astronomy, this is called dispersion. Doctor Bell Burnell demonstrated this effect, via whistling. It is essentially what one hears, if you listen to a radio telescope (in practice, most analysis is done on digital signal data, though). The way that the whistle’s note changes as it is received is an indication of how much dispersion it has undergone. Since dispersion is a consequence of travelling through a medium, and the interstellar medium is fairly constant, the distance to the source can be estimated by the sound of the whistle. This whistling phenomenon is also handy to separate out deep space sources from local sources on the surface of the Earth (a person closing a microwave door, for example, can confuse a radio telescope), which don’t whistle, with the exception of lighting strikes on the other side of the globe from the radio telescope. By the way, Dr. Bell-Burnell noted that one should make sure that the micro-wave oven is off, before opening the door, or you will be exposed to a short burst of microwaves, as the opening door shuts off the transmitter a fraction of a second after the door begins to open. At any rate, fast radio bursts have been observed. They are highly dispersed short pulses (they don’t last long, but they have a nice whistle). Besides the celebrated microwave oven door effect, some 17 unexplained fast radio bursts have been observed. They are hard to explain with current theories, as they don’t seem to be correlated with sources in any other wavelengths. So far, the best explanation is that this is related to the final collapse of a super-massive star. As rotation spins down, gravity takes over from centrifugal force, and the star collapses into a highly condensed object such as a black hole. A number new radio telescopes are planned or under construction, that will help us to understand transient radio sources better. A big one is the square kilometer array, which will be located in South Africa and Australia. The size of the array will enable it to be 50 times as sensitive as current radio telescopes, and will be able to survey the sky ten thousand times faster. LOFAR, the low frequency array, in Europe , will use interferometer techniques to give the effect of a telescope with an extremely large aperture. It is hoped that this instrument will help pin down the source of transient radio phenomena. Finally, it is worth noting that gravitational waves have recently been shown to exist, and have observed what is thought to be a merger of two black holes, in a distant galaxy in the disant past. The gravitational waves, whose signal was detected by incredibly small spacial displacements (a fraction of the width of a proton), damped out very quickly, on the order of a second or so. This may well be the ultimate in transient astronomy. It is evident from the forgoing, that transient astronomy is an active and growing field. Many new instruments are being designed and built, some on the ground and some in space. It is quite a new field, so we expect a lot of new objects will be discovered, and therefore a lot of new theories will be developed, along with revisions of old theories. And, that is how science works. It is worth noting that Dr. Bell Burnell is a practising Quaker. Her book on science and religion, "A Quaker Astronomer Reflects: Can a scientist also be religious? ", is an interesting and thoughtful one, for those interested in the subject. It's available on Amazon in ebook form. Science is cool (especially transient astronomy), but so is Science Fiction. So, you should consider reading the books described below. 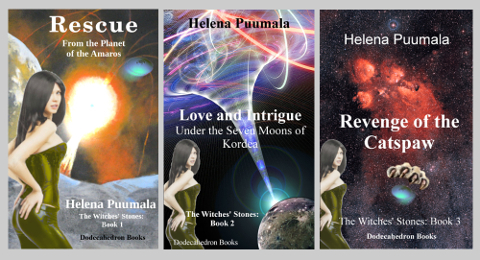 Book 1 even includes a soft gamma repeater, a type of neutron star (magnetar) that can release as much energy in a few seconds as the sun can in a year. How’s that, for transient astronomy! But The Organization has plans of its own, including threatening the destruction of the planet Kordea, via destabalizing the orbit of Lina, one of its many moons. The Organization proves that its threats are in deadly earnest, so, ultimately Sarah, Coryn and the Witches of Kordea must take the fight to the enemy. Thus is borne a dangerous mission, to a planet where their foe has based the weapon that threatens Kordea, and ultimately, the balance of power throughout the galaxy. Sarah and Coryn agree that the machine must be destroyed, even at the possible cost of their own lives and growing love. Sarah and Coryn have become married, under the traditions of the Witches of Kordea. But the marriage is performed by the Eldest of the most important coven, a rare honour, that comes with a blessing and a curse. The slow working out of this blessing and curse forms the backdrop to the story. Postmedia – Investor Battle Over?